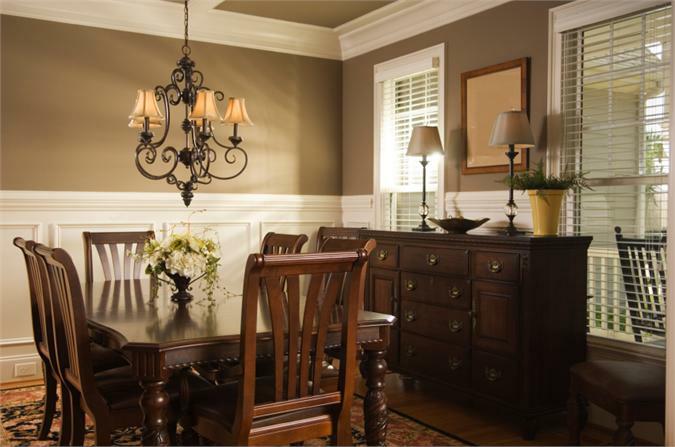 This beautiful dining room combines classical elegance with contemporary comfort. The decorator accentuates this room with rich honey oak floors, formal English Country style furnishings and a flair of Louis Phillipe. Persian-style area rug, solid wood dining set, sideboard with solid brass pulls all reflect attention to detail and taste. The traditional whitewashed wainscoting and crown molding subtly beautify the prominently dark features of the room. Chair rails have both a decorative and practical function. When applied to the wall about 36 inches above the baseboard our ET-8719 Chair Rail/Casings make a beautiful accent to this room while also protecting the wall from scuffs and dents from the backs of chairs. Flat Molding can also be used as boiseries or Panel Moldings to form the frames on the walls and ceilings. I suggest a smaller, complementary molding to our ET-8719 molding such as our ET-8718 Molding to achieve the wall panels design shown here. 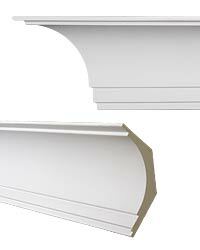 Use a molding such as our ET-8719 Molding to trim around the windows. This will give the room a uniform, complete appearance. I like to think of the ceiling as the 5th Wall. Unfortunately, ceilings are oft ignored and left white; but, with little effort and imagination, the ceiling can be transformed into the intimate dining room you experience here. Repainting the ceiling is a great place to start for giving your room a little facelift. This decorator chose to use the same taupe pigment on the ceilings as on the walls tying together the entire room floor to ceiling. But why stop there? Was Michaelangelo satisfied with extraordinary? No. He wasn't happy until he literally saw the finger of god and sighed to himself, "Masterpiece." You should be no less distinguishing. Don't just paint; finish. Use our ET-8711 Molding to create the ceiling panels like the ones shown here. Use our coordinating ET-8711 Corners to create a ceiling that is uniquely yours. Masterpiece. If big is good, then bigger is better. Really large moldings can be cumbersome and expensive. So, make it easier on yourself and your budget by making your own combo-molding. 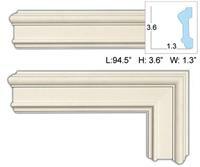 Start with our 6" CM-1144 Cove Molding. Then, trim the base of the molding with the same ET-8711 Molding as above. This will give the room a uniform, complete look. No room is complete without a good baseboard and this room is no exception. I would suggest, to closely approximate the effect seen here, a good sized baseboard such as our ET-8906 Baseboard. This will give your walls a little extra dimension and appeal.